On the day after his Philadelphia concert, Tom Petty's brown suede jacket, the same one he wore on stage, hangs on the back of a chair in his hotel room. When Petty himself walks in, his outfit, too, matches that of the previous night: blue jeans, a white shirt, a dark vest. This is appropriate, because the Tom Petty you get in person is not all that different from the one you get on stage. Up close, you can see that his blond hair is thinning, his face a bit worn. Like his music, Petty is direct, unpretentious. He's not too keen on publicity: "Being on the cover of Rolling Stone terrifies me," he says. But once he gets going, he's a thorough talker; when he hits on a subject, he likes to get to the bottom of it. And his conversation, like his songs, communicates a sense of conviction. He's easy to believe in. Tom Petty's concerts have always been straightforward. Theatrics are kept to a minimum. On the current nationwide, which was scheduled to stop in town this past Saturday night, the set list gives a kind of time-lapse look at his career. Concentrating on his two most recent albums, the show manages to touch upon almost every moment of Petty's recording history. There's a short acoustic medley of songs from his first two albums, and the biggest hit off each of his next four records, "Refugee," "The Waiting," "You Got Lucky," and "Don't Come Around Here No More." The concert's hat tricks come in the form of two nonoriginal songs: the Count Five's 1960s classic "Psychotic Reaction," which his longtime backup group, the Heartbreakers, perform with all the spitfire of a club band, and an introspective reading of the 1989 Van Morrison ballad "I'm Tired Joey Boy." The songs cover more than 25 years of rock-and-roll history, and Petty has lived through it all. Now, with the release of his 10th album, "Into the Great Wide Open," he has reached, if not exactly a crossroads, then certainly a point of reflection. "Into the Great Wide Open" is all about reflection. Two of its 12 stories deal with a subject perhaps closer to Petty than any, that of being a teenager in a rock-and-roll band; almost all the others -- many cowritten with Petty's friend and co-producer Jeff Lynne -- look at either the past or the distant future from the narrative vantage point of the present. The album, says Petty, "is about being young and old." In the wide open spaces between the acoustic guitars, you can almost feel time passing through the songs like a wind. The inner sleeve graphics superimpose the lyrics over diagrams of clouds and constellations, a kind of literal depiction of the imagery filling the songs. "It seemed like when I was a kid in the '60s, it was so easy to be a teenager," he says "Everyone was so united on what we were about. Now there's so many different ways to go. I mean, a lot of young kids are Republicans. It's a whole different thing now. I was just trying to compare it to my own youth." Unlike other American songwriters of his generation -- Bruce Springsteen, Don Henley, John Mellencamp -- Petty, 40, hasn't resigned himself to rock-and-roll adulthood. He continues to try to make sense of rock as the music of youth, and to understand himself in that context. "Into the Great Wide Open" uses simple but elegant metaphorical language to look at the promises of adolescence, and what can become of dreams later in life. He is the only rocker over 40 making honest, articulate and nonpatronizing music for and about his primary audience: teen-agers. When Petty was growing up, things were different. He came of age in the mid to late '60s, watching bands like the Beatles on "The Ed Sullivan Show," listening to Elvis Presley singles he had traded for a slingshot. At that time, here in his hometown of Gainesville, rock-and-roll was, pure and simple, the music of transcendence. 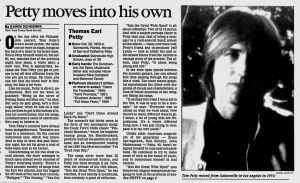 Petty tried other work: construction, washing dishes at a barbecue restaurant, even digging graves -- "It was the only job in 1967 where they didn't make you cut your hair off," he says. Nothing panned out: "I got fired from every job I ever had. Without exception. Because I obviously wasn't that interested." Although he also played in high school and club bands from the ages of 14 to 17, he had no expectation of making it a career. "I grew up without any money, but I never saw this job as one that was going to make me money," he said. "I was just sort of accepting that my life was going to be one of struggling to get by. Like, 'Well, I'm not going to go to college, but I really like playing and that's what I'm going to do.'" With this in mind, he left home at 17 and played in bands around Florida, then eventually headed for Los Angeles. By the mid-'70s, he and the Heartbreakers had signed a record deal, and their eponymous debut album was released in 1976. The songs on "Tom Petty and the Heartbreakers" are swathed in innocence: jangly, upbeat tunes like "American Girl" or the more somber "The Wild One, Forever," sound more like paeans to archetypal rock-and-roll figures (the Girl and the Tough Girl) than narratives based on real-life experience. "I think I was innocent in some ways," Petty says. "When we started in this business, it was a lot more innocent than it is now. Now it's very organized, it's big business." Even after the Heartbreakers began to skyrocket with their third album, "Damn the Torpedoes," in 1979, the struggles remained. Before the album's release, he became involved in a complex contractual lawsuit when his first label, Shelter Records, was sold to MCA; these frustrations gave birth to the album's title. But the real battle was still to come. "Damn the Torpedoes" spawned no fewer than four instant FM radio classics, and the Heartbreakers became marketable. MCA decided that their fourth album, "Hard Promises," should be one of the first titles to undergo a price hike, from $8.98 to $9.98. To retaliate, Petty threatened to change the album's title to $8.98. "It was very obvious to me at the time that you can't price this stuff out of the range of the average fella, or girl," he says. "None of us needs another dollar on every record. I was already rich, and they" -- the record company executives -- "damn sure were rich. So, being young and stubborn, I wouldn't turn the record in." Petty won that battle, but the victory had long-term repercussions. "When it came to my next record," he said, "I couldn't even get an ad." For personal and professional reasons his career slumped in the ensuing years with "Long After Dark," the belabored "Southern Accent" and "Let Me Up (I've Had Enough)." It wasn't until 1989 that he got a fresh perspective with an acoustic-based solo album, "Full Moon Fever," and a sideline project called the Traveling Wilburys (the supergroup featuring George Harrison, Jeff Lynne, Bob Dylan and the late Roy Orbison). The hard lessons he learned, though, have stayed with him. "If you really take this record business seriously, it will just kill all desire to do anything," he says. "The innocence is gone. It won't be back. It's gone." By the time it came to making "Full Moon Fever," Petty had little to lose. He temporarily freed himself from the Heartbreakers, hooked up with a new-found friend, Jeff Lynne, and decided not to take anything too seriously. "'Full Moon Fever' was like skipping school," he says. "It was emancipation. I was just enjoying myself every day." The album went on to sell more than three million copies. Since the word "fan" is in fact derivative of "fanatic," let's stick with the latter when talking about Cathy Buffington and Gay Cook. Last week, these two women -- who only met face to face a month ago -- followed their mutual idols, Tom Petty and the Heartbreakers, to Gainesville for the band's homecoming concert scheduled for Saturday. 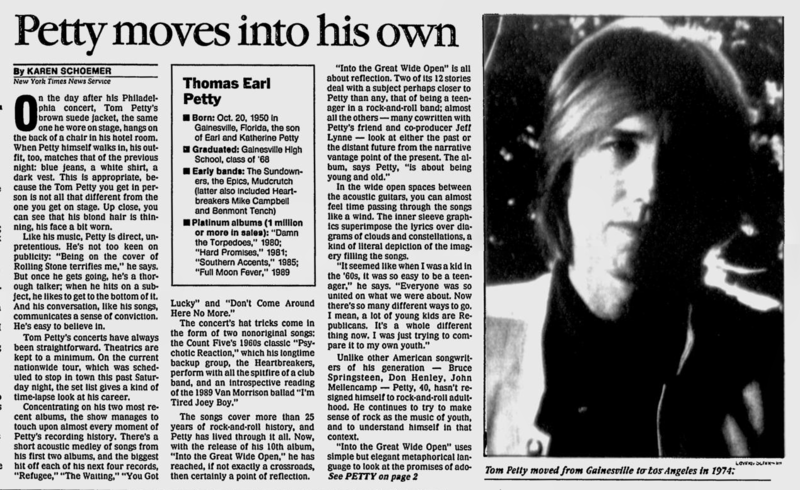 It was to be the eighth show on Petty's current tour for Buffington, who lives in Pleasant Hill, Calif., and Cook, from Edinborough, Pa. When the tour ends in Los Angeles next month, the pair will have taken in a total of 13 concerts, in cities as disparate as Cincinnati, Pittsburgh, Atlanta, Oakland and ... Gainesville. "It takes a whole show, first of all, for me to watch Mike's hands playing the guitar," says Buffington, who's learning to play on her official Tom Petty Richenbacker 12-string, "And then a whole other show to listen to the music. It takes me about five shows to see the whole thing." Says Cook, "The thing is, each show is different because the fans are so different, and the way Tom reacts to the fans is so different. It's a different show each time." These are no giddy teenyboppers taking Daddy's money on a cross-country spending spree. Buffington is 41, the owner and operator of a school for learning-disabled children and a respected tutor and consultant; Cook, a stock operator in a grocery store, is 37. They're both, they're fond of saying, old enough to know better. "I don't think I'm embarrassed," Cook confesses, "although I've had to explain myself to a lot of people. And since there's really no serious explanation, it makes it kind of tough. It's just something that I really wanted to do." "The students that I teach all think it's really cool that I'm doing this -- and I think it's pretty neat, too," Buffington says. "You might as well have fun. "And they're really a fun band to watch. I don't know, I guess it makes me feel young -- except that I don't feel old, anyway." These two serious fans were introduced by a rare-record dealer in 1989 and have spent many long hours on the phone, talking Heartbreakers. Both have large collections of records and memorabilia -- "I have a list of the memorabilia that I have, and it's 29 typed single-spaced pages," says Buffington proudly. Her collection includes albums, singles, CDs, tour books, posters, T-shirts, autographed items and other odds and ends. Her 12-string guitar (Tom, she wonders, why aren't you playing it on this tour?) set her back $1,200. At an average at $150 per ticket, paid to "ticket brokers" along the way, Buffington and Cook are sparing no expense to get close to the musicians. "And it's worth every penny," says Cook. In every city, the pair hold up signs for the band members. They do it, they say, just to say thank you. It's important to them that the Heartbreakers know they're, in Buffington's words, "really harmless. We just love them." Indeed, Buffington's husband is supportive, too, and will be going along on all the California dates.